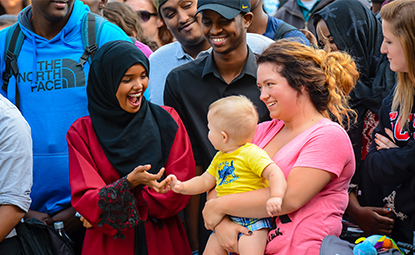 Students who major in sociology work toward a deeper understanding of how people live and work together in times of harmony and in times of discord and what makes societies work. Through classes, internships and volunteer opportunities, you'll learn problem-solving skills that are powerful tools in the interactions between individuals, groups, organizations, communities, societies and on global issues. And, you'll build a foundation of skills in writing, oral communication, analytical thinking and interpersonal relations. You'll discover that studies in sociology are excellent preparation for a variety of careers and a solid base when combined with other work choices. Active faculty research with student collaboration encouraged. Emphasis on sociological approaches to thinking about social change. Internship opportunities are wide and varied and include work in the fields of corrections, market research, advocacy, program administration, human resources, and management training. Requests for student research have included a survey of older persons' satisfaction with nutrition programs or needs assessments. A recent intern worked to develop a program on educating the public about Medicare fraud. Internship program cited as a model for others by Commission on Applied and Clinical Sociology. Faculty and students engaged in timely, relevant research including immigrant workers in Minnesota, politics and food resources, social inequality, and environmental sociology. Sociology Professor Tracy Ore is the force behind St. Cloud State Community Garden, which was voted Best Community Garden in Minnesota by viewers of WCCO Television. Sociology alumni work in a variety of human service areas for government, nonprofits and businesses such as corrections, gerontology, social welfare, counseling or sales and human resources.